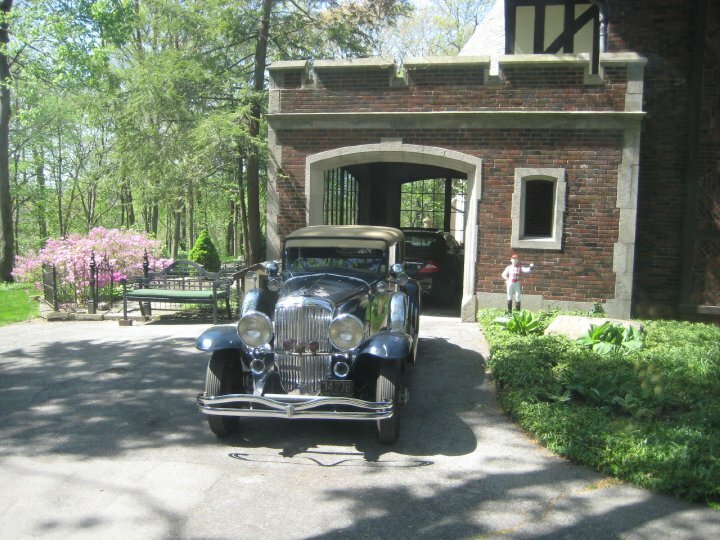 Now tucked away behind gates amongst old growth trees and more contemporary homes, sits the 1916 estate of Stoughton Fletcher, the Millersville millionaire. The Jacobean Revival-style manor designed by Herbert L. Bass (noted architect of the Holcomb estate and Test Building on the Circle) is situated on six acres of winding lanes, beautifully-landscaped lawns and elegant gardens. Great-uncle Calvin Fletcher brought the family to Indiana from Ohio in 1821. Though nearly penniless when he arrived, Calvin was a disciplined and religious man who applied his industry to farming, land speculation, community service and his profession. 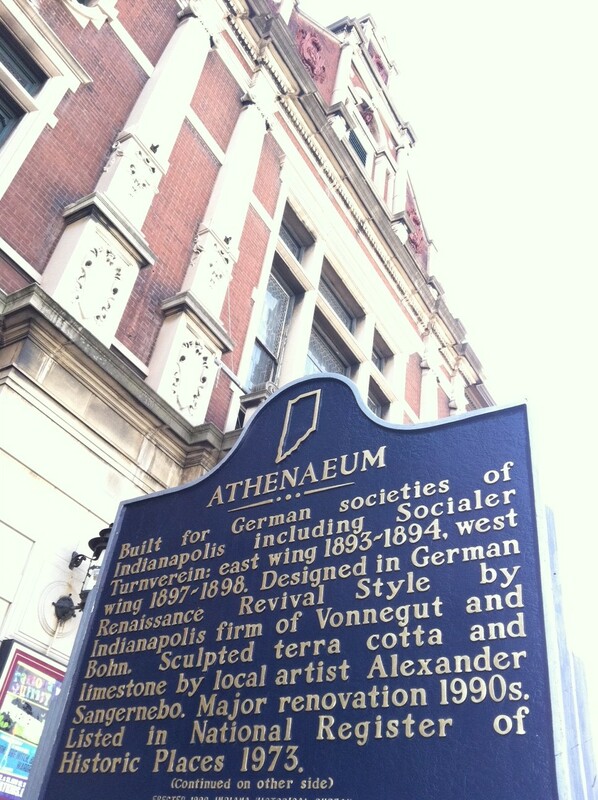 Local lore has it that Fletcher was, at the time of his arrival, the only lawyer in Indianapolis. In later years, he also became a state legislator (1825-33) and thereby established the first State Bank of Indiana. Calvin passed away in 1886 from complications that arose from a fall from a horse, two months earlier. A marble bust of Calvin Fletcher can be found in the Indiana Statehouse. Calvin’s brother, Stoughton A. Fletcher, would eventually found a private bank 1n 1839: S.A. Fletcher and Co. Following S.A.’s death, Calvin’s son Stoughton J. Fletcher, took the reins, transforming “Fletcher’s Bank” into a national bank in 1900. Sadly, S.J.’s health failed as well, and he was forced to pass the bank management to his son, the next Stoughton A. Fletcher. By 1920, S.A. II had negotiated several bank mergers which resulted in the company becoming the largest national bank in Indiana — Fletcher American National Bank. It was during this brief time of immense prosperity for the family that S.A.II built Laurel Hall (named for his mother) at the cost of $2,100,000, situated amongst farm- and woodlands. For its time , it was the largest private home in the state (40 rooms comprising 38,000 sq. ft.). It’s still part of the current local lore that after Stoughton bought the initial 1500 acre property, he was not satisfied and therefore also attempted to buy all the land east of Emerson down to 46th St. — but the small Highland cemetery thwarted his purchase; He was unable to find enough relatives of the persons interred at the cemetery to gain permission to move the graves. Laurel Hall – view from the entry. In contrast to the rather staid reputation of his progenitors, S.A.II had a reputation for extravagance and eccentric behavior. Laurel Hall showcased this personal taste for extreme luxury. Curved brick walls that wrapped around to where the gates once stood can still be seen today. While traveling the road that led to the manor house, guests were treated to ravines and waterfalls amid rare trees imported by Fletcher’s Belgian landscape architect. Water cascaded from a Grecian temple which still exists today (now on the grounds of Cathedral High School). It took a staff of 10 to manage the estate. A separate building in the English Gothic style housed servants’ quarters, garages, as well as enormous boilers that sent steam heat to the manor through a lengthy tunnel. Completing the estate were five cottages, greenhouses, stables & horse trails — and even a small race track for Fletcher’s favorite equestrian hobby. Regrettably the tall, stone water tower and lookout, positioned for an amazing view of Fall Creek valley, was destroyed in recent years to make room for a new development, east of Emerson Way. … the “mating party” he hosted on the mansion’s front lawn for Peter the Great, a famous trotting sire. Those care-free times must have been glorious, but they were brief. As it did for the whole of the country, World War I changed the family’s fortunes, and not for the better. Responding to the government’s need for turbine engines, S.A. Fletcher heavily invested his personal assets, expecting to turn a tidy profit. To facilitate swift production, he bought two major industrial firms and combined them to gain their patents and manufacturing capacity while pledging his personal assets and the estate as collateral. But just when the new company had retooled and was ready for production, the war ended. The government cancelled all its contracts with Fletcher and, in 1919 he lost virtually everything — truly a victim of the Armistice. With his personal fortune in peril, Fletcher had been compelled to give up his controlling interest in the Fletcher American National Bank by 1921. Laurel Hall: a lower dining room that opens into a palm tree-lined solarium with marble floors. Personal tragedy also struck the Fletcher family that year. Stoughton’s wife, May, having been afflicted with stomach problems and “nervous trouble,” took her own life by ingesting poison. Her mother, Mrs. Eva Henley, found her daughter’s body and, in the clutches of despair, drank the remaining potion. The sad story was the banner headline of the Indianapolis News the next day, and the source of neighborhood conjecture for generations. By 1923, the Fletcher fortune disintegrated. Stoughton was forced to relinquish all ties to the family bank. One year later, with only $481.39 to his name and owing $1,763,602.54, Fletcher declared bankruptcy and the Fletcher American National Bank took ownership of Laurel Hall. 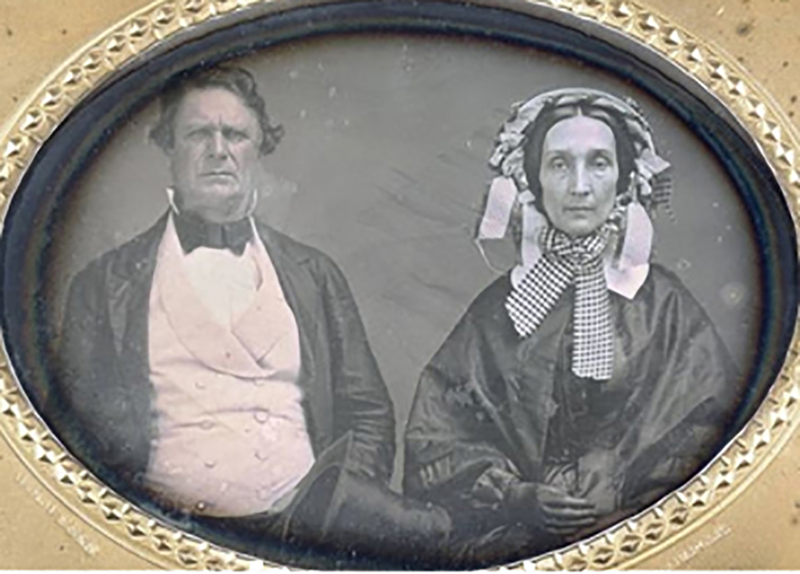 In later years, suicide would again plague the family, taking an additional two members — Stoughton’s son and daughter in separate incidents (Stoughton J. known as “Bruz” and Laurel Louisa). Stoughton himself died of natural causes in 1957, having served out his twilight years as an elevator operator in California. The central staircase at Laurel Hall. 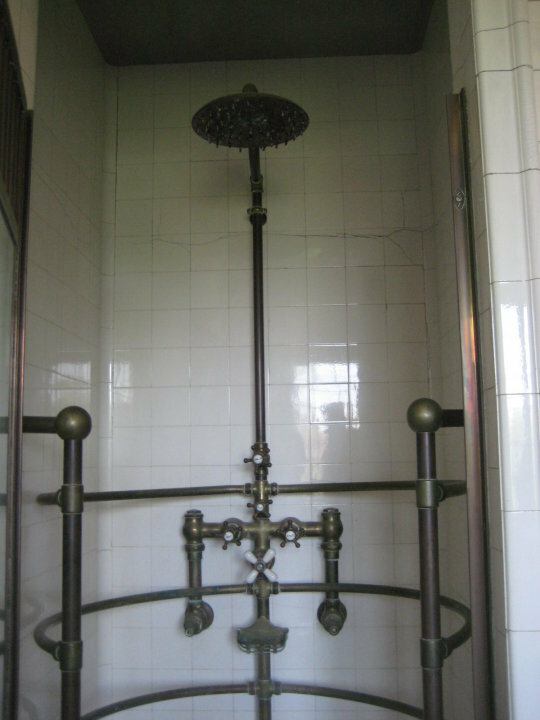 High-end bathing technology in one of the bathrooms at Laurel Hall. The Sisters of Providence purchased the estate from the bank in 1925, along with the “garage and power house, a large greenhouse with three wings, five stucco houses, five cottages, a laundry room and more than 220 acres of surrounding land,” for $600,000. With additional buildings, the organization founded one of the most impressive preparatory schools in the nation — Ladywood, a Catholic, all-girls boarding school. Over the years, a Ladywood diploma became highly regarded and the school attracted the daughters of some of the nation’s most wealthy families. 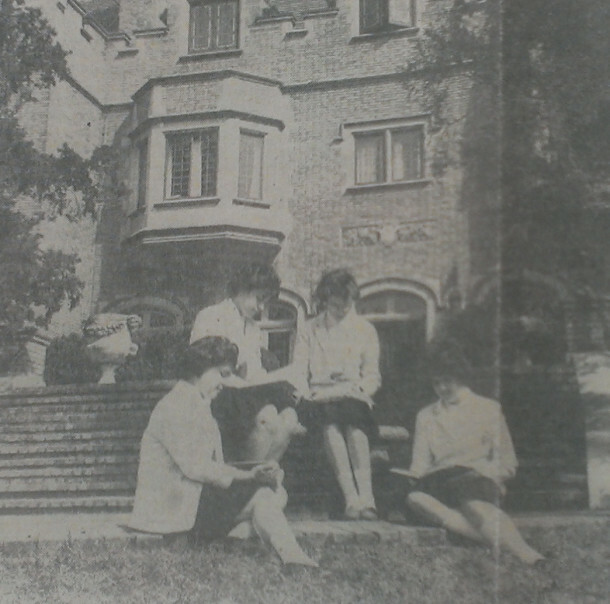 Students at Ladywood School relax on the lawn in 1962. In 1963, a new building was opened, expanding Ladywood’s capacity to 600 students. Rather than strengthening the school’s financial situation, this expansion accelerated Ladywood’s downfall. A 1970 merger with St. Agnes, another Sisters of Providence school, did not improve the school’s viability. Thus, Laurel Hall was sold to a local businessman in 1974. Just a taste of the gardens and grounds. Is this where those legendary cement mixer martinis were served? Robert V. Welch chose to develop the property for housing. Calling it the Windridge Condominiums, homes sprang up around Laurel Hall, with the “Manor House” playing the central role of the complex’s office and entertainment center. Thirty-four acres of the estate were later sold to Cathedral High School (an all-boys school at the time) which allowed the school to finally open its doors to women after acquiring the property. However, the sale of that property was not enough to save the Welch venture. High interest rates in the housing market eventually forced Welch to relinquish Laurel Hall. It was once again taken over by the bank. In 1984, the Hudson Institute purchased Laurel Hall for its national headquarters and operated in that location until 2004, when it moved operations to Washington, D.C. 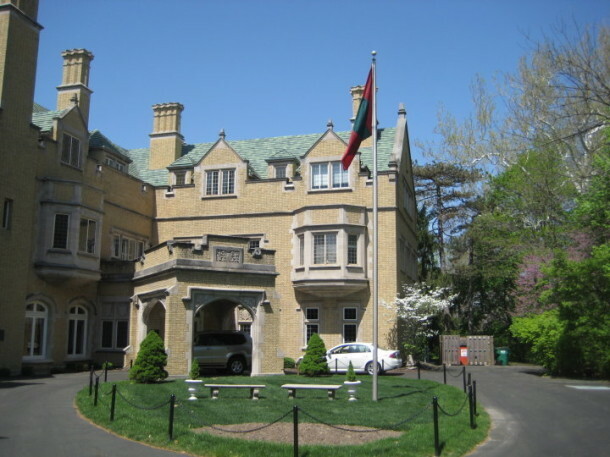 In May of 2005, the property changed hands once again when the Phi Kappa Psi Foundation purchased the estate for its new headquarters, events venue, and educational center. Since that time, Laurel Hall has played host to a multitude of special events — from local weddings to receptions for international dignitaries. 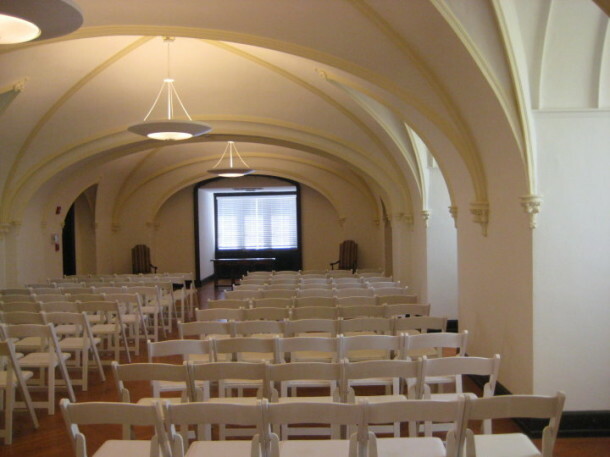 The ballroom above stairs: a popular wedding location. Interested in more detail about the Fletcher family of Laurel Hall? 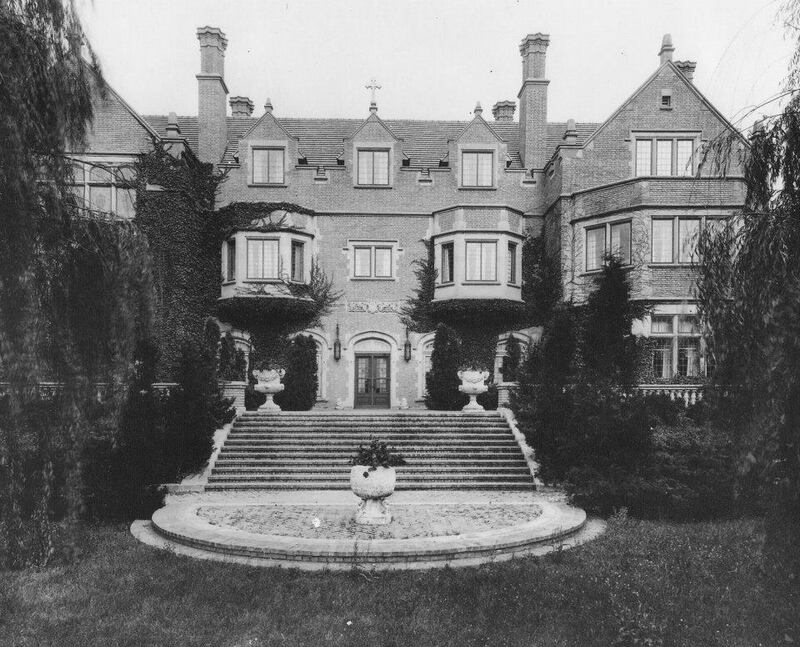 – Author Kate Lenkowsky has written a 22-page booklet about the mansion. – Donald Carmony’s “Indiana, 1816 to 1850: The Pioneer Era” gives more detail about the early Fletchers. Both resources can be found at the Indiana Historical Society and through the Indianapolis Marion County library system. Are you a Millersvillian who grew up hearing tales of Fletcher antics? Did you attend Ladywood, or visit Hudson Institute? Herbert L Bass the architect of Laurel Hall was my Grandfather. I would like to obtain the 22-page booklet you mentioned. Thanks, Joan! I adjusted the caption. I wondered about the photo… the woman looked significantly younger than Calvin as would be likely in a second marriage — but the name of the digital photo that was sent to me said “Calvin and Sara.” I’m sure you’re right, though. I can’t get the link you mentioned to work and I’d really like to see the material. Is there another way to get to it? I don’t know how far back it went but at least as far as 30’s because when I was a teen-ager living in Marion it was a status spot locals (like my flapper mother) drove to for “live” musicians who played there.) My own personal knowledge starts in the mid-40’s when as a local journalist it was the”upscale” place you could not afford financially but could not afford not to make part of your “beat” because that’s where the best local political gossip/office-holders hid out. Today I am puzzled by my limited memory of the “hotel” aspect–I don’t remember ever seeing,visiting a registration lobby etc…my personal memory is of entering from a lower level door to the”BlueRoom” and/or going up a short flight of stairs to an upper type bar where you were funneled to while waiting for a dining table to open (this came into being when farther north ritzy Keys Club made an art of over-booking dinner guests in order to send them to wait and spend larger $$$ at the bar—because there was more dough in booze than food! Greylyn copied and hired a popular almost “savant” type bartender named Moriarity whose fame was an amazing recall of what each drinker’s favorite was–tales abounded of those who visited only one or 2 times but on returning much much later were stunned when Moriarity would greet them with “OH yes, you’re the extra dry martini straight up” or whatever their long ago order had been. The Greylynn was already in place, then in the later 40’s in an area of once grand homes, and among the grandest, long vacant it seems to me, was a palatial 3 story stone home that was on the east side of Penn, about a block or two north of the Greylynn. I don’t know why my memory recalls it as “the old Stoughton Fletcher” or “old Fletcher” mansion–but I do know that in the era after 2 politically-connected sisters opened the elite, keyholders-only (briefly) KEYS, about l900 N. Meridian,w.side of street, there began a “Bermuda triangle” of smart set clubs/bars. The 1800 to 2400 Meridian stretch included Sandy’s piano bar where Flo Garvin, Andre pianists brought crowdes (both African-American in a bar whose owner declared the “first n ——–will come in over my dead body”–but people went there anyway, farther north the Keys, later Jaguar Club and Embers farther north on w. side/ John Macri’s Italian Village, a dimly remembered jazz club ( Southern Barbecue maybe>(&FLASH, the city’s very first pizza joint in the mid-50’s. We were part of a young singles, newly weds whose evenings out started in the staid Marott HOtel Bluebird Room Bar (and adjoining high end eatery, name forgotten), then made a circuit to Keys, Embers for live “stars” Jaguar Room on east side of Meridian in old garage, owned by JackEnsley where Mel Torme would drop in and play drums, sing past closing time, or perhaps start with after-work drinks at Blue Room and work our way north. Thus entrepreneur Harley Horton entered the scene—he purchased and restored at incredible cost the “mystery” Fletcher mansion converting it into a dinner, dancing mecca, bringing in live performers like legendary Jack Teegarten, Louis Armstrong–the best of the best. I can only remember the first floor lounge’s décor and its “first” ebony grand piano which played mechanical rolls, and its ballroom where Teegarten held forth among many other big bands, musical greats of the era. (Perhaps local jazz historian Duncan Schiedt would know more.) The name is on the edge of my aged brain….it will come to me I hope before I finish this message. The year or years it held sway are dim–I know it was before l951 but how long it held sway I do not remember. During that era Harley was a personal friend of many of our group–we were among the select few invited to his River Rd. “mansion”–then in a remote area along the river–which boasted a built-in “soda fountain” type bar where instead of malts you could “push” levers for top brand booze. It had a 2 way huge fireplace which on the outside —facing swimming area–there were warming,drying niches for bathing suits. His bedroom was done in either leopard,zebra–some exotic animal–and reputedly the fur bedspread on king size bed was”pure mink”–but with Harley who knows. So to my question. What was the mansion/later upscale watering hole, when did it hold sway and why does the memory of thedoomed S.F. family link to it in my memory? *Print copy to mail to Jolene K.
Thank you so much for the comments you made about Laurel Hall, the former Fletcher mansion. My father was Jack Ensley, and all of the stories of the Jaguar Room are legendary in our family. My dad died in 1972, and of course, we had no internet etc. to see info about everything from the past. I am now finding stuff like your memories completely by accident, and it is so wonderful for me. I really hope that you receive this reply, as your comments were from a couple of years ago. It is so weird, because for some reason I started thinking about Laurel Hall a couple of years ago. I went to Tudor Hall and Orchard Country Day School in the 60s, and we would occasionally go to Laurel Hall, as I think it was a sister school or something. I never expected to find this connection to my dad’s nightclub through Laurel Hall info, but thanks to you, I did! It’s interesting how Stoughton Fletcher II’s estate was “further out” in a creek valley like his forebearer’s former country estate, Clifford Place, which was located “above” Pogues Run, also east-northeast of the city at the time of its development. Michael Spades’ estate was near Clifford Place as well, along Pogues Run, which was then donated to the city for Spades Park and Spades Park library. Later Fletcher’s forebearers gave a portion of their estate as Brookside Park, also along Pogues Run and developed Fletcher’s Brookside Addition as a middle income area bordering both sides of Pogues Run..
Hello, my name is Braden Catt. I am currently working on a master’s thesis specifically focusing on the history of Pogue’s Run from the 1820s to the time of its sewering in the late nineteenth and early twentieth centuries. I am very impressed with your knowledge on the subject of Pogue’s Run and am curious to know some of your sources on it. While I have quite an extensive collection of sources compiled, you possess very specific knowledge in areas like park development and the Fletcher family’s connection to the stream. That sounds like a very informative subject for your Master’s thesis. I found a photo of Stoughton Fletcher Senior’s “country estate” home Clifford Place (and one can look at the photo and see the pasture land sloping “downhill” towards what would have to be Pogue’s Run in the background behind his house and barn) in Flickr as prepared by Joan Hostetler’s site on Flickr. There is also a map dated 1899 showing a small stream called Crooked Run as a tributary to Pogue’s Run running across the southwest corner of Indianapolis Arsenal (now Arseanl Technical High School) on her site, I believe. That was the lowest downstream left bank tributary of Pogue’s Run ’til it was culverted and storm-sewered about 1910-1911. Pogue’s Run also angled south from under Union Station and ran through the south side, emptying into White River just north of Raymond Street ’til the storm-sewering of Pogue’s Run in 1915. I believe 1915 can be verified by the Indianapolis Dept of Public Works. That department used to have a set of photos on the Indygov.org internet site in about 2003, showing the actual construction of the storm sewer It was very informative, along with a short history of Pogue’s Run and prior efforts to channelize it prior to 1915. I would assume they have photos and that narrative still available with a scheduled visit, for instance. If you can think of any other questions, please advise. 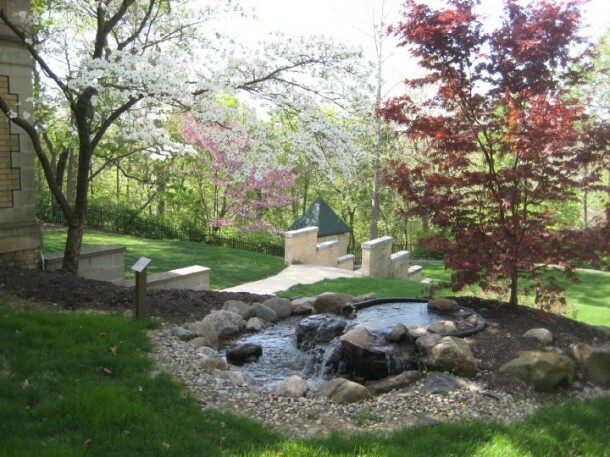 The “last” current left bank tributary to Pogue’s Run (upstream several miles from Crooked Run) is a small stream called Brookside Creek that joins Pogue’s at Forest Manor Park on the city’s east side. i grew up playing there as a ‘kid’, incidentally! I attended Ladywood – St. Agnes until in close (after my freshman year). Thanks for the history and peek into Laurel Hall. Thanks, Lisa. It is good to know the people behind the buildings. Grew up on Laurel Hall Drive, which is where the stables once were. Was interested to hear about the lookout tower, did not know that was apart of the estate. Lots of childhood memories of roaming the grounds. 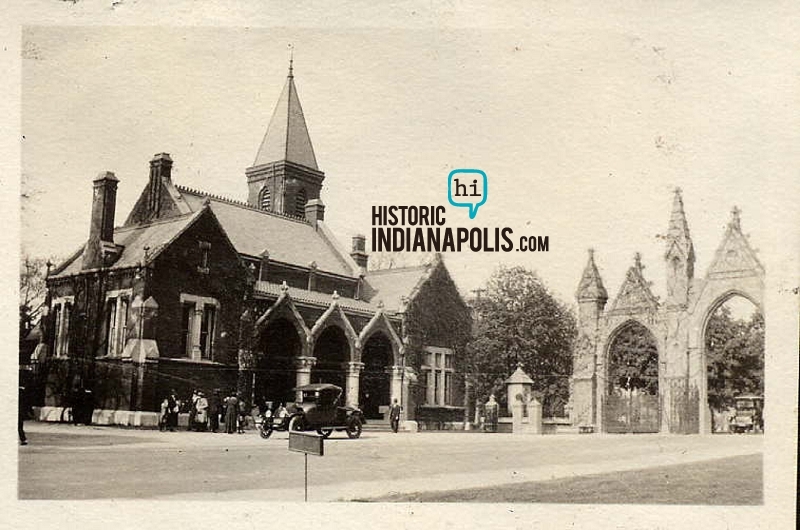 Article was very interesting, its a wonderful piece of Indianapolis history. 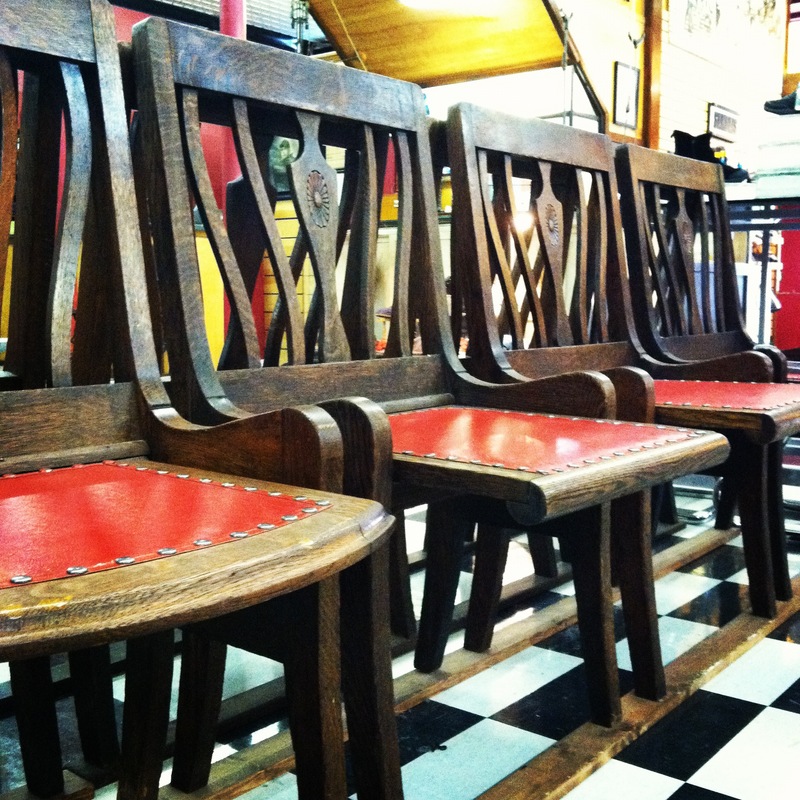 One of Indy’s most hidden and prized treasures, that’s for sure! What a beautiful location for a wedding, shower or anniversary celebration. Beautiful setting with a fascinating story of its history. Thank you for sharing. Thanks for the wonderful Ladywood memories! My late sister, Kathy Sloan, attended Ladywood from 1959 through 1963 I believe. She made lifelong friends and often shared things taught by the sisters with her family members, ie – break your bread in four pieces, but only butter each piece as you are ready to eat it. Also, many wonderful and impressive educational memories. She attended school with international students from Monterey, Mexico and from Thailand. I vividly recall the beautiful Christmas cantata performed on the balcony and staircase of Laurel Hall. The photo of the students may be of Kathy, second from right, and Susie Hauns, far right. Interestingly, we were Presbyterians, but Kathy was welcomed in the religion classes, and she told of many lively, intellectual discussions among the students and nuns. She certainly did receive a world class education at Ladywood School. I enjoyed the article immensely! Barbara, that photo was in the April 8, 1962 Indianapolis Times. There were no names in the caption but it certainly corresponds to the time your sister attended the school. I love the tidbits and memories you (and others) have shared here. Thanks for reading! As a 1962 graduate of Ladywood, I remember Kathy Sloan. She was a very sweet intelligent girl. So sorry for your loss. I boarded and lived in Laurel Hall. That special time spent with the nuns, international students and all my classmates hold a very special place in my heart. In 2016 I had the pleasure of returning to the mansion for an alumni reunion day. Laurel Hall was as beautiful as ever. It was a very special day seeing my bedroom and sharing many cherished memories. it was a fun four years at ladywood. i was in the junior class when we merged with st. agnes. we were not allowed to go to laurel hall unless we had a class. i did not board. such sad history for this house but at least it still stands and looks in good repair. I attended my nephew’s wedding there last November, Pam. It’s in beautiful shape. Pi Kappa Psi appears to be doing a great job maintaining the venue. I was an intern at the Hudson Institute in January 1991 during the first Gulf War. How heady it was for a 21-year-old to pull up that magnificent drive and work in such an historically significant building for such a prestigious think-tank! During that time, the news crews would come almost every evening to get the Middle East expert’s take on the day’s events of the war. The “expert” would watch CNN about 5 minutes before they arrived, then pontificate and use big words to seem like he really knew what was going on … when all he was doing was giving his opinion on 5 minutes of CNN news! That always cracked me up! The shower you pictured is where the paper was stored for the copy room when I worked there, and the ballroom was where I worked; cubicles and tables with computers lined the walls. I wonder if Kate Lenkowsky’s father is Les Lenkowsky, who was head of Hudson Institute during my brief time there. After readying Calvin Fletcher’s 3-volume diary (a MUST-read for Indianapolis history addicts! ), I wondered if the pragmatic, religious city-founder wasn’t rolling over in his Crown Hill grave at the antics of his great-nephew! Natalie, great personal story! Thanks for sharing. I suspect that the two Lenkowskys are related, as her booklet about Laurel Hall was written and published during the time Hudson Institute was located there. i was a student and boarder at ladywood school! Calvin Fletcher had a lot to do with the founding of Crown Hill, so he’s one of the main stops on a tour Sept 15 celebrating the 150th anniversary of its incorporation. Stoughton, his wife May, and Laurel are buried together on the large Fletcher lot. Only their initials are on their headstones so it can be hard to pick them out, but they are included on Crown Hill’s “Skeletons in the Closet” tour. Their son, Stoughton J. “Bruz” has a monument with them, but he is not buried there. There is a great website about Bruz Fletcher that includes a lot of family history. Thanks for this great piece and thanks for mentioning Bruz. Tyler Alper’s web site devoted to Stoughton Fletcher V (aka Bruz) is an a fascinating resource so I have posted a link here. Bruz’s life (and that of his Aunt Hilda Fletcher – a lesbian) is an amazing and perhaps unique window onto the lives (albeit rarified) of GLBT Hoosiers in the pre-war era. Lisa I grew up in Indianapolis and lived east at 42nd and Emerson Ave. I went to Arlington HS 1968. We used to ride our bicycles around this area back then and remember when they widened Emerson to what it is now.. I had friends that went to Ladywood. It seems that there was a second entrance off of 46 Street. When Windridge was developed the School entrance used the back way and the grounds were divided. You couldn’t get between the school and mansion as the roads were blocked or changed. In 1975-76 I worked in Information Technology (IT) for Mayflower Corporation on Michigan RD. We were developing a new system to track their moves and accounting. We did this in conjunction with Aurthur Anderson Inc. the accounting firm. They brought a team of IT people in to help, they were given living allowance / per-deem. 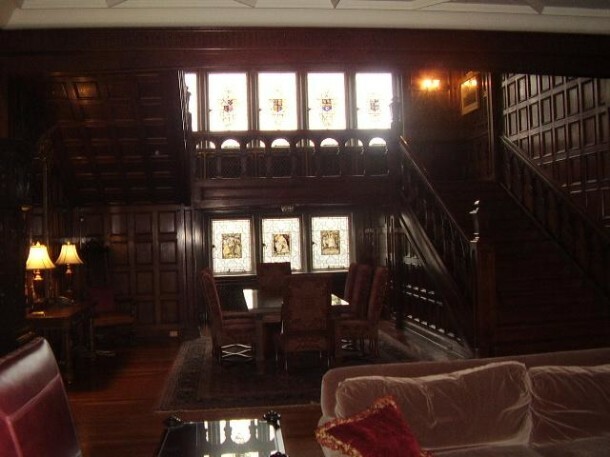 One of the guys (Stu same 1st name) was looking for and apartment and found the Fletcher Mansion – Laurel Hall. At that time they were developing the housing portion of Windridge and renovated the mansion. They decided to rent out the upper 2 – 3 floors and Stu rented on of the apartments. There was a group of us all single and we started to get together at the mansion and had parties – and gatherings. We explored the mansion and all of the apartments and floors. There were stories of the mansion being haunted by the mother and daughter – we saw funny things during our time there. I also thought that one of the sons go into an auto accident while returning and crashed on the road leading up to the house. (True or not?) It was also said the some one hung them selves from the main chandelier in the entry. Any way that the house is haunted – we say and felt thing that we couldn’t explain. They took the main hall way on each floor and blocked them making individual apartments and entries in these units – the hall way they made in to kitchen – kitchenettes – the halls were so wide. There were 2 bath rooms per unit with the tub and shower. Showers were a real turn on. As the water you turned on knob and set the water temperature and then opened another knob to turn on water from the huge daisy shower heat above. Then there was another knob that turned on a fine spray that came at you from the sides – we had a lot of fun. We searched and roamed the mansion and hung out there a lot during 1975 – 76. We even had a New Years Eve party and had over 1,000 people show up. Like I said no one else was living there yet. The guards at the gate started turning people away and would let any more people in. One of the Fletchers had purchased the race house Man-A-War from the Triple Crown fame. He would ride the horse into the house , into the living room and library – you enter and turn left into the formal living area ( which has very high ceiling). There were hidden passages in some of the floors and back stairs on each end. We had our closing project party catered at the mansion by Mayflower Corp (movers) and Aurthur Anderson CO. and then every one moved or went back home. I have one of the formal sales media about Windridge and the Mansion from then. I also have some party pictures from then. I moved to Denver CO in 1977. The library and music rooms were at the far end of this room.. The unit that my friend Stu had was on the 2nd floor and had bay windows on each side – one became the bedroom the other the living area. As a kid growing up on Eastbourne Drive in the 1960’s, my first experiences with the Ladywood School area came via walks into the woods which surrounded the estate with my dad and younger brother starting around 1962 maybe. He would pack a picnic lunch and we would explore. The remnants of a pond obviously build for swimming, but long since drained, with you young trees growing up in it was still there. My dad laid the foundations for my interest in history by telling us about the area. There were also the remnants of two brick outhouses with tile roofs left there at the time. My dad explained that the original estate owner was very well to do, and wanted to make sure his family and guest were well prepared for many years ago. Continuing down a road that had crushed coal cinders “paving” it led us to the estate power plant. At that time Eastbourne dead ended into farm fields and woods that were part of the entire estate. By the time we moved in 1967, Eastbourne had cut all the way through to the Fall Creek area, and houses were built in the area, but the woods stayed intact. I spent many hours playing in the woods with neighborhood kids, but never ventured past the power plant to the school itself. It was an amazing area to grow up in and around. I was saddened to see it eventually built up. I grew up “down” off East 21st and Emerson. When we were younger, my parents would take a “country drive” up Emerson to 46th, and east past Arlington; at that time there was a prosperous looking dairy farm on 46th where Devington Shopping Center was built, and up Arlington (which was a graveled road then, north of 46th), with fields, then woods up to 56th. Back to Emerson, we drove a short distance north of 46th where Emerson had not been extended as “Emerson Way” downhill over Fall Creek. Emerson was gravel north 46th for just a short distance and one could stop facing north, and see the Millersville community downhill at Fall Creek, and fields and woods north, east, and west, and one could see Laurel Hall to the northeast, on the bluffs “by itself”. Damn! This dates me! Thanks so much for this interesting piece. I attended Ladywood my junior and senior years of high school, lived in the room with the big bay window above the heads of the girls sitting on the steps in your 1962 photo. We had lovely cabbage-rose wallpaper, a chaise lounge and two facing desks in that bay. Somewhere, I have a Ladywood brochure/booklet, circa 1946, before my time. If I can find it, I’ll send you a copy. The photos in it are wonderful. The “wedding chapel” pictured here looks very bland indeed.. That attic/upper floor space was a beautifully painted chapel with pretty little prie duex, suitable for the proper young ladies we were supposed to be. We actually weren’t all that proper. Like high school girls everywhere, we’d sneak the occasional cigarette, and if we’d heard about that martini-making cement mixer, we’d have searched high and low to find it. I am a member of the Ladywood class of 1970. The Senior Christmas dance (1969) was held in Laurel Hall. I remember beautiful decorations and walking down the front staircase in my red velvet Madrigal skirt and a very ruffle blouse. I had not been in Laurel Hall before and, even now, I remember how amazed I was by the beauty of the building. I very much enjoyed reading about Laurel Hall. Thank you! I recently bought a very beautiful and unique mid-century home on Laurel Circle North Drive which is tucked away further down Millersville Road across from Mallard Lake. After talking with a new neighbor about the history of the property, the rest of Laurel Circle Drive North, and the surrounding area, I was quite intrigued and thought I’d seek out more information about this part of our city. Honestly, before finding and falling in love with my new home, I had never been on this side of Broad Ripple much. If you know of anywhere else I should look to get more information about this area online, please let me know. The historical society will be my next stop when I find the time. For now though, it was great hearing about Laurel Hall and the Fletcher Family. The club in which you are referencing in the above article belonged to my late Grandfather, Harley L. Horton. The name of it was LaRue’s Supper Club located at 1121 North Pennsylvania Avenue. I went to Christ the King Grade School. Upon graduation, the girls either went to Chatard (my choice) or Ladywood. I visited there many times during our high school years. The bank was known as AFNB–American Fletcher National Bank. In 1977, my dad and stepmother built a condo at Windridge. So I found myself on the grounds once again when visiting them. My dad and I would take walks all over the grounds. 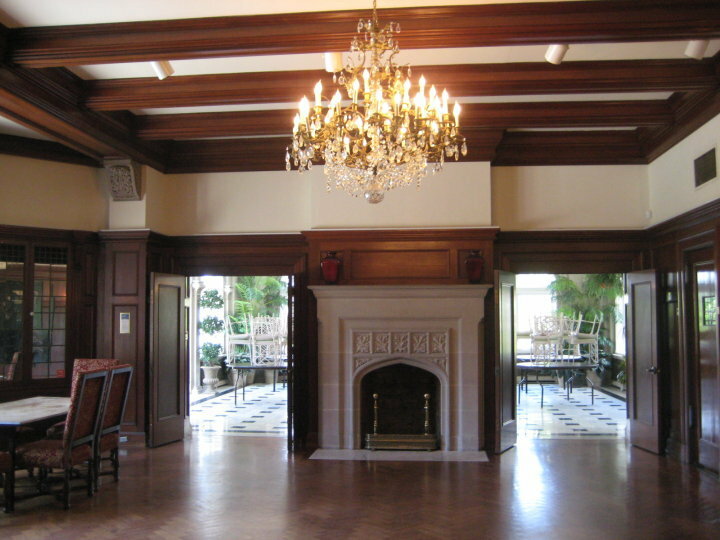 The dining room of Laurel Hall was gourmet, members only dining club called The Manor House. We would walk over and enjoyed many delicious meals there. At that time the upstairs rooms had been turned into apartments. The last time I was there was in the 90s when my dear high school friend got married there. The only ones there were my friend and her new husband, my husband and me, and the minister. So I have several decades of different memories of the beautiful property. I enjoyed reading about the early history of the estate. Thank you. 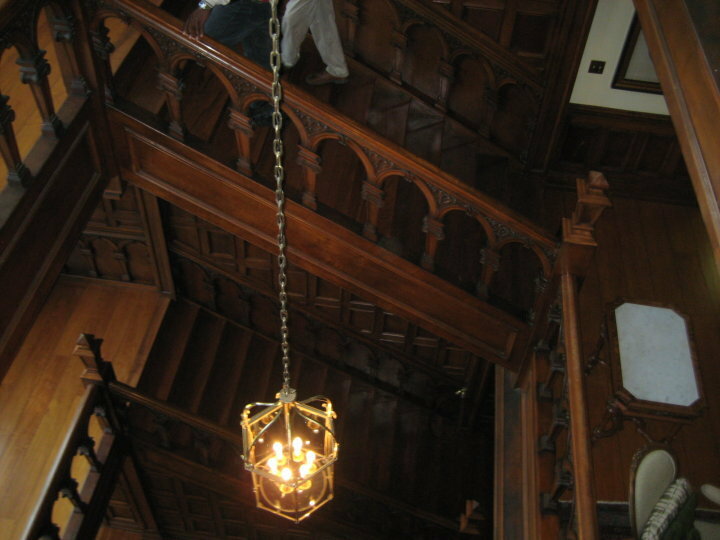 Former Student at Cathedral High School: My Ghostly Encounter at Laurel Hall. October 1983. I was in Gym class at Cathedral, and that day we had used the old Cross Country Trail behind the school that ran through the gully underneath Laurel Hall. I had fallen behind the pack and became hopelessly lost on the trail when I discovered a brick cobblestone path that took me up the bank and came out in what I assume was the Garden area of the mansion itself. This was just after Walsh had handed it over to the banks and before the arrival of Hudson Institute. When I came up the bank and into the garden area, I swear there was young attractive woman strolling the area in period dress of the late 1800s or early 1900s. It was near 1:00 in the afternoon. She was no more then fifty feet ahead of me all the time and walked around the corner of the mansion, where I followed her. She led me directly to the old stone bridge that was in back of Cathedral at the time and pointed to it (the one that came out directly in front of the school’s theater before the new development). By the time I caught up to her, she had vanished, dissipated just like mist. Left chills in me to this day. She looked happy and content with smiles. I know there were several tragic deaths in the place in its heyday, so I assume she was once the Mistress of the place. My sisters and I attended Ladywood from 1960-1969, I am from the class of ’66. We were boarders and lived in Laurel Hall our Junior and Senior years. We received a world class education while attending Ladywood. My mother, having been from Europe, expected her daughters to be educated by the nuns. Being in an all girls college prep school gave us an advantage in furthering our education. We recently had our class reunion ( all years) in October at the Manor House. Although the National Fraternity that is presently there has tried to return the mansion to its original state, the property is not anywhere near the pristine condition it was in here during the Ladywood years. Unfortunately the Hudson Institute “trashed” the place, destroying the marble and teak wood flooring. I enjoyed the article giving the history of the property. I enjoyed reading of your school experience. In 1966 I was 9 and lived in the neighborhood surrounding the property in Devonshire. I have many fond memories playing there and seeing the old power plant. My dad knew a bit of the history of the property then, and that is where I began to appreciate the study of history. I am sorry that the buildings were not maintained as they were when you were a student. I attended Ladywood Saint Agnes in 1975-76 and Cathedral 77-78. I lived in Brendonridge, which backs up to the old estate to the east. I wanted to let you know that one of Ladywood’s early students was the famous actress Dorothy McGuire. This is great information. The property has such a rich and important history to our state and you wrote about it beautifully. I’ve heard that there are some ghost stories with the location. Would you know anything about those? With October here and Halloween around the corner, some good ghost stories are just what we need. Laurel Hall was home to my husband and I for almost 2 years between 1981 and 1983. We had the privilege of residing in 2 of the 6 luxury apartments; The Arbor Suite and The Tudor Suite. As Stuart Greenwood describes in his post above, Laurel Hall was a historical and architectural phenomenon. It was quite by accident that we found the apartment; we happened to see the advertisement in the Indianapolis star, it read as follows: “Unusual opportunity for the discerning renter in an estate setting…$500.50/month all utilities included”. Well, it was love at first sight, we signed the lease and moved to Laurel Hall June 1st,1981. What a fabulous property, beautiful grounds with imported plantings, trees and shrubs. Springtime at Laurel Hall was spectacular; hundreds of daffodils dotted the hillside on the drive up to the estate, redbuds with watercolor purple blooms were in abundance. Tall pines throughout the property gave off an earthy scent especially during the spring gentle rain. The grounds boasted a huge metal lined pool that was available for the apartment residents and condo owners; I have to say we almost always had the pool to ourselves, we were in our own private paradise. From time to time, we would have lunch on the front terrace at the vintage concrete tables shaded by umbrellas or at the pool always prepared by Chef Hubert Schmieder at the Manor Club. Memorable moments drinking iced tea from frosty wine glasses and devouring the savory BLT’s…days past. Being immersed in such a lavish setting, you couldn’t ignore the history, architecture and grace of Laurel Hall. Exotic woodwork throughout, black and white terrazzo mosaic tiles, leaded glass windows, mile high ceilings, triple wide staircases and landings, dozens of wood burning fireplaces, a library, a 3rd floor ballroom fit for a queen, numerous sitting rooms, solarium/dining room, spacious outdoor terraces boasting lovely views from every angle, state of the art vintage plumbing (towel warmers, wrap around showers, huge claw footed tubs and pedestal sinks with original hardware). I think we explored every aspect inside out, always discovering something new and interesting. We too heard the stories of the “ghosts” thathaunted the halls at night especially the ballroom. Residing at Laurel Hall was quite memorable from the luxurious surroundings and history to the eclectic group of people we had the opportunity to meet. We’ve since moved away from Indianapolis to coastal Alabama but Laurel Hall will always hold a special place in my heart. You can view this property in aerial photos going back tp 1937. You can even see the racetrack on the 1937 map. The link is fascinating. I attended Ladywood, probably in 1954/55, as a freshman and boarded at the school. I was entranced by Laurel Hall; the drawing room, the music room, the library, the dining room and terrace, and the ballroom, which had been converted to a chapel. I loved the grounds and roamed whenever I could. The history of the home was fascinating. After one year, my 13 year old self decided the atmosphere was overly restrictive and left for a different school. In some ways, I wish I had remained. My freshman class consisted of only 13 girls, and the education earned even that brief year has stuck with me One of the sisters must have had a strong theatrical interest, because “A Midsummer Night’s Dream was enacted on the lawn in front of the house at the end of the year, and another play was presented in the drawing room. There were weekly movies in the huge entrance, some of which I distinctly remember. Meals were excellent. That is where I first had fried oysters. The dining room was magnificent, and on occasion a meal would be moved onto the terrace, which opened off the entire side of the building. I would love to visit and see the building again one day. What a pleasure to read about the elegant naptown prep schools, an experience I could only read about. I did meet a few of the Tudor students at advanced Girl Scout camp in 1949, and a former student attended my high school. The sister of one of my tent mates (Beth?) was an Olympic swimmer. Very nice girls. Re Keys Club: We had our pre-wedding dinner there in 1958. What a disappointment. Yes, we were herded to the bar, and the rooms were unexceptional. Our young waiter insulted my youthful-looking husband-to-be, referring to him as “the boy.” At least the food was good. 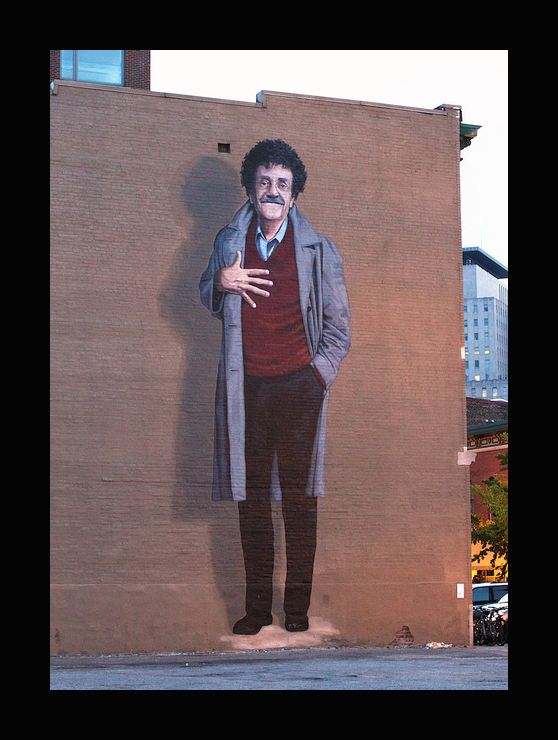 I walked nine blocks to and from school 58 (RW Emerson) four times a day from my N. Bancroft two-story craftsman house in a mixed working class/white collar neighborhood, a block west of Emerson Ave. A few outstanding teachers there. Berniece Orndorff, I’d previously mentioned here, had graduated from Columbia and Cambridge U. and been an English dept head and a college Dean of Women. She taught English and my homeroom for three years, but we moved to Southport at the second semester of the third year. One of my two favorite teachers— the other, Richard Rupp, at my MA University was also from Indianapolis and studied at Indiana and Georgetown—a bonafide Renaissance man. Does anyone recall the brown-toned mansion on E. Washington St. near Emerson Ave. where we took our sleds to the hill that took us right to the Washington traffic? Either an accident (a rumor) or the fear of one finally put an end to our glorious sledding years. I’d dragged a much-too-heavy sled several blocks to get there. We called it Brown’s Hill, and it was said to be the home of one of the owners of the Indianapolis Star. I’ve always been curious about who lived there. Does anyone one know? Thank you, and thanks for all the memories. I really enjoyed this information about Laurel Hall. I am the person who wired the apts. there for cable tv in the early 80’s. I think there were eight or nine apts. I had to wire. I was the odd man out in the company I worked for at the time ,so where there were usually two guys working together I usually worked by myself on smaller apt. buildings. Usually eight or nine units would take me a day or less. This took me three days to complete. At first I was a little upset that it was going to take me so long due to the complexity of the building as I got paid by the job and not by the hour. Once I learned a little about the history and began to appreciate the beauty and architecture of the building I didn’t mind the extra time it took me. I remember the outside walls took every bit of an 18 in. drill bit to get through and I also remember crawling over the top of the ballroom ceiling to run one of the cables. That was a most interesting job and have thought about it many times through the years. Thanks for the history lesson, now I appreciate it even more. A doctor I worked for through the 70’s had one of the first Windridge condominiums built. He invited the whole staff for a Christmas luncheon at Laurel Hall’s dining room. Beautiful setting and a wonderful memory especially since he and most of the staff have passed away.